If, like us, you believe that the best way to experience a city is by walking about and getting lost in it, then you will love our Cebu city walking tour! Cebu city is the main city of the island of Cebu, and if you are heading down to the central-south part of the Philippines, it is very likely you will need to pass through it. Cebu island is home to several towns and villages, many famous for their unique attractions, most popular of which are the diving and ‘sardine run’ at Moalboal, the turquoise waters of Kawasan Falls and the Whale Shark sightings at Oslob. The island is also a popular gateway to other destinations such as Siquijor and Apo Island. Less popular with the tourist community is the island’s capital, Cebu city, the second most populated city in the Philippines after the capital Manila. 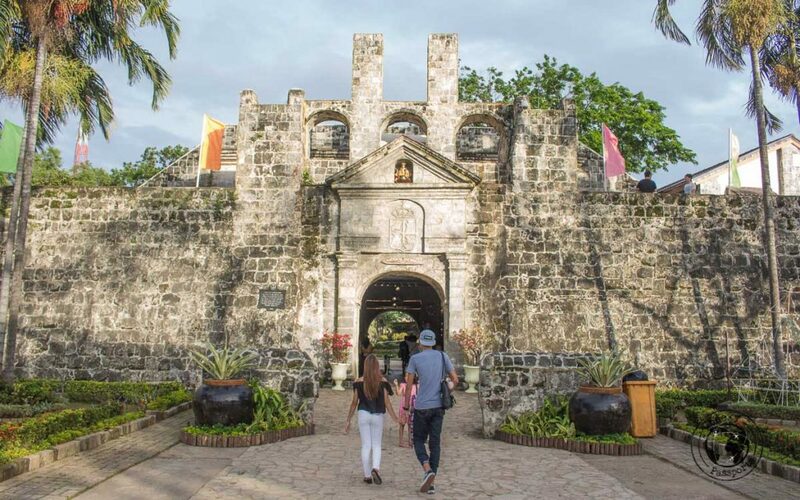 Typically overlooked by the crowds, or rather, only considered to be a stopover for its connections to other tourist hotspots through its Mactan airport and bus terminals, Cebu City is rarely itself a tourist destination, but this Cebu city walking tour will take you through all the best spots! Although nowadays it presents itself as a metropolitan city, inclusive of top notch hotels, enormous malls and its own traffic issues, Cebu City boasts an ancient history, seeing that Cebu was amongst the first of the Philippine islands to be colonised by the Spanish way back in 1565. 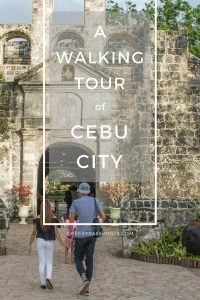 For those wishing to explore the city on foot, here’s a half day Cebu city walking tour. For starters, don’t forget to pack up your water on your Cebu city walking tour! This is a 10km walk which could take around 4 hours. The map of the trip is available here. We always promote indipendent travel, however if you need a little help, check these Cebu city tours on Viator. 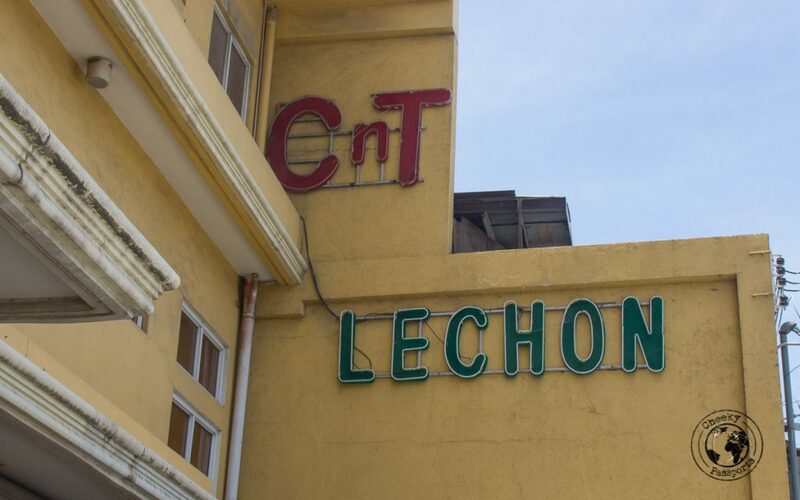 This is the first waypoint on this Cebu city walking tour. 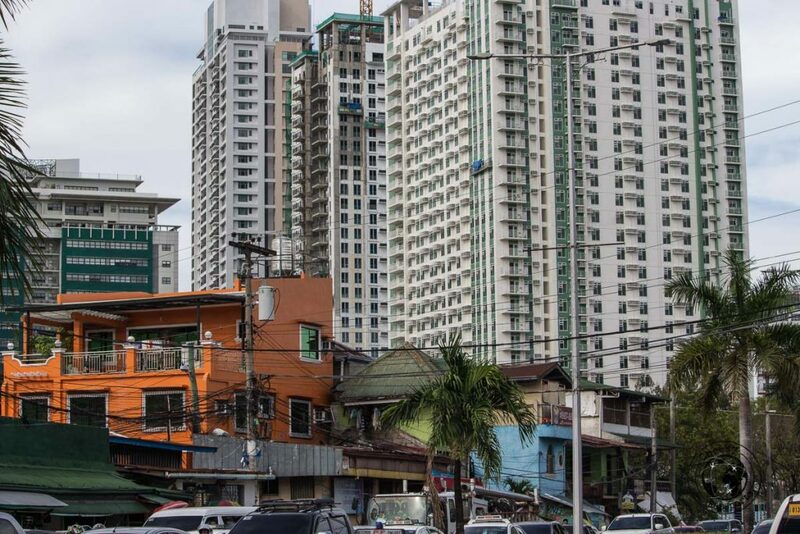 Don’t worry, we do not like malls either, but this is a unique opportunity to observe a different Cebu City, one which is evolving into a metropolis no different from any major city. The tall buildings, corporate offices, and yes, a high end Ayala Shopping mall, present a stark contrast to the older and perhaps more authentic parts of the city. Indeed, this difference is felt immediately a few 100 meters en-route to the second waypoint, the Sugbo Museum. 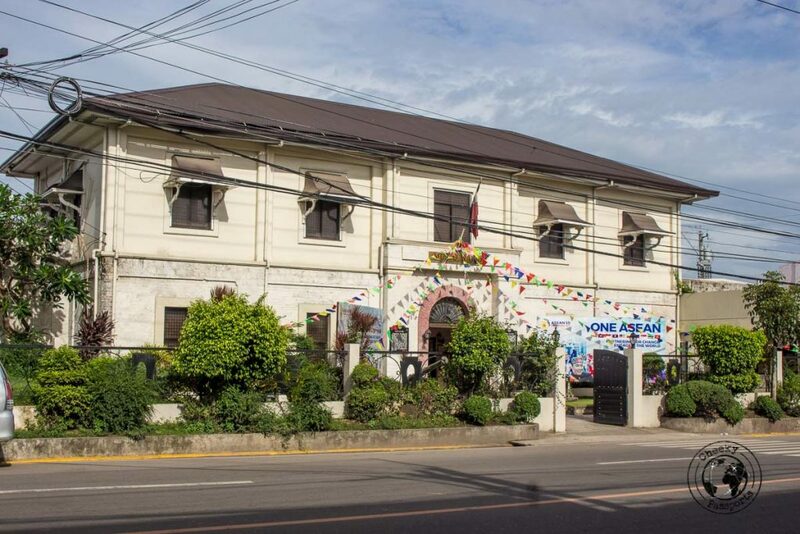 Formerly designed to serve as the provincial prison of Cebu, this structure dates back to the late 19th century, and was still in use for the same disciplinary purposes until 2004, when the prisoners were transferred to more modern facilities and this building converted to a museum. Nowadays it hosts galleries with exhibits from the pre- and post-colonial eras, as well as WWII memorabilia. The architecture of this building is an masterpiece in itself. It’s built from Coral Stone blocks, historically recycled from an ancient district (Parian) church, itself a victim of a very territorial Bishop at the time! Well worth stopping here on your Cebu city walking tour! 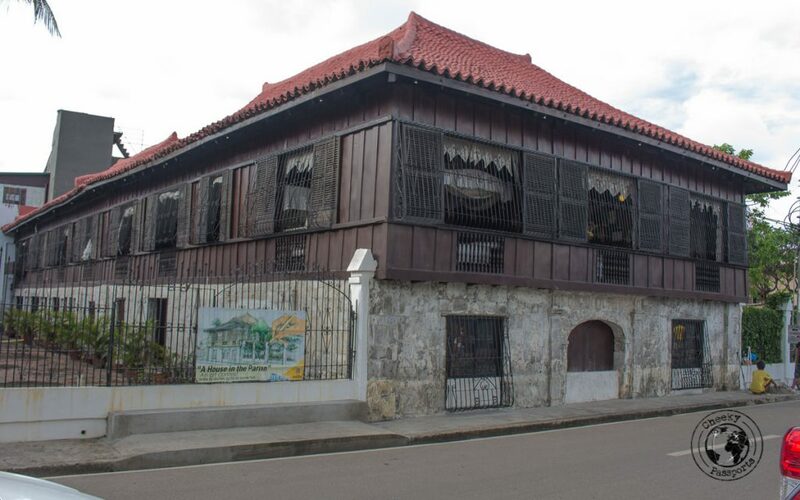 Formerly the official residence of Juan Gorordo, the first Filipino Bishop of Cebu, this majestic building was restored by the present curating foundation and converted in a display of Filippino upper class lifestyle during the 19th century. The building is one of the few remaining structures showcasing typical royalty buildings, erected using wood, bamboo and coral stone. The wooden structure is held together in a traditional manner, with pegs and wedges, using no nails at all. 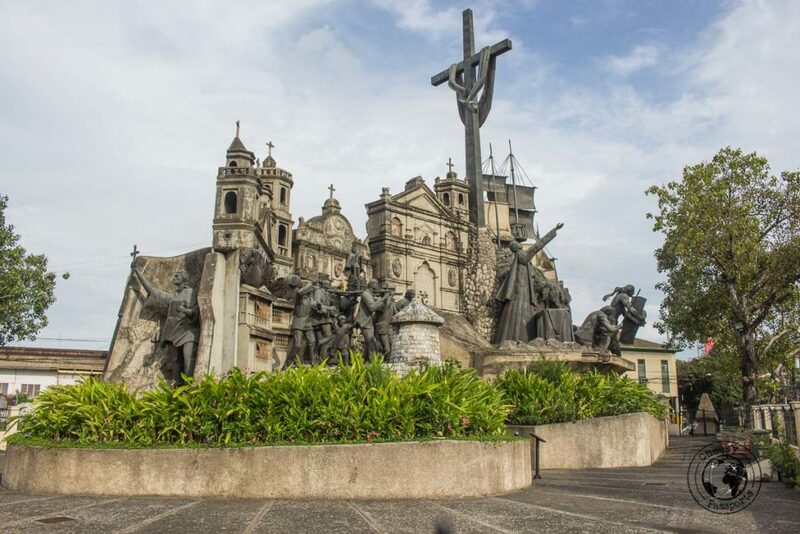 Just around the block from Casa Gorordo, you can find the very large Heritage of Cebu Momument, an impressive tribute to the history of the city, somehow reminiscent of Portugal’s monument to the conquistadores. 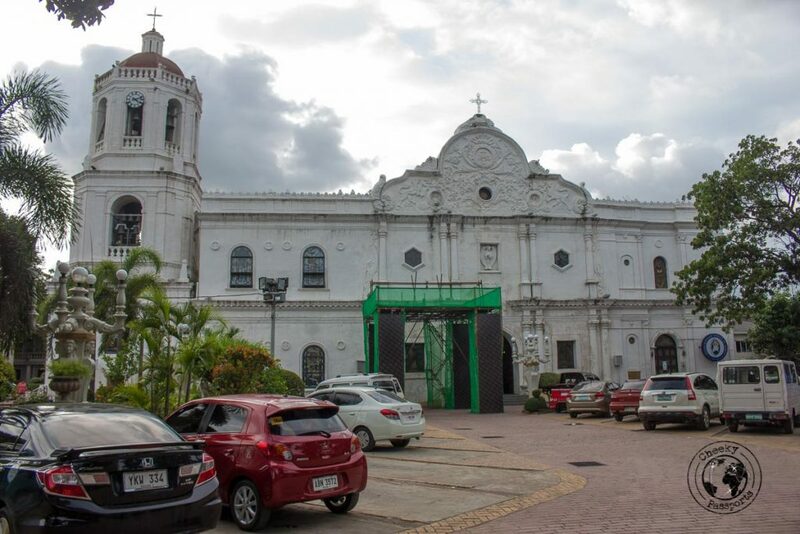 The massive structure is a collection of what is important in the national heritage of Cebu, inclusive of many landmarks on this list such as the Basicilica del Santo Niño and the Magallen’s Cross (more about these later). 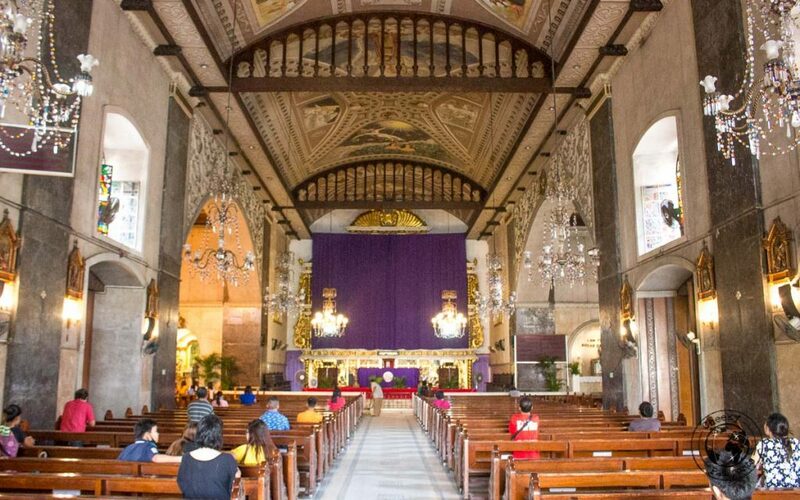 Interestingly enough, the site was previously occupied by the Parian Church, the same church which was demolished and whose stone was used to construct the structure now known as the Sugbo Musuem. Seat to the Archdiocese of Cebu, this church was amongst the first to be conceived by the Spanish upon their arrival in 1565. The structure itself has a rich history and was subject to multiple financing and logistical pitfalls, besides numerous destructive events of the natural kind; it has been built and rebuilt many times in the course of almost 3 centuries. It is dedicated to St. Vidal whose feast, celebrated on the 28th of April, coincides with the day the Spanish landed in Cebu. The Spanish colonial facade does give its origins away. The church popularity (and eventual expansion) gained ground only in the late 19th century after the demolition of the Parian Church (remember the Sugbo Museum!). The facade and belfry of the church survived WWII bombings, however the rest of the building was not so lucky. The church was subsequently reconstructed in 1950. The remains of Juan Gorordo are interred here. 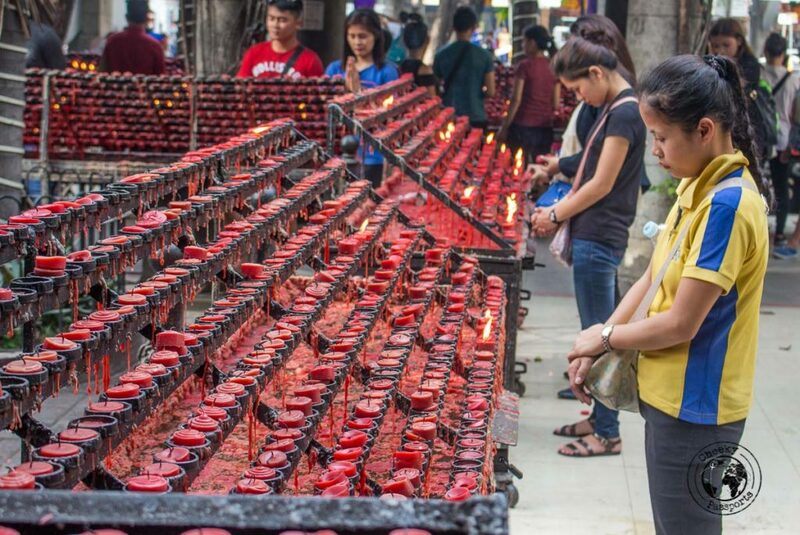 The statue of the Santo Niño (literally Holy Child) is the most venerated religious symbol of the Philippines making this Basilica an obligatory stop on your Cebu city walking tour. 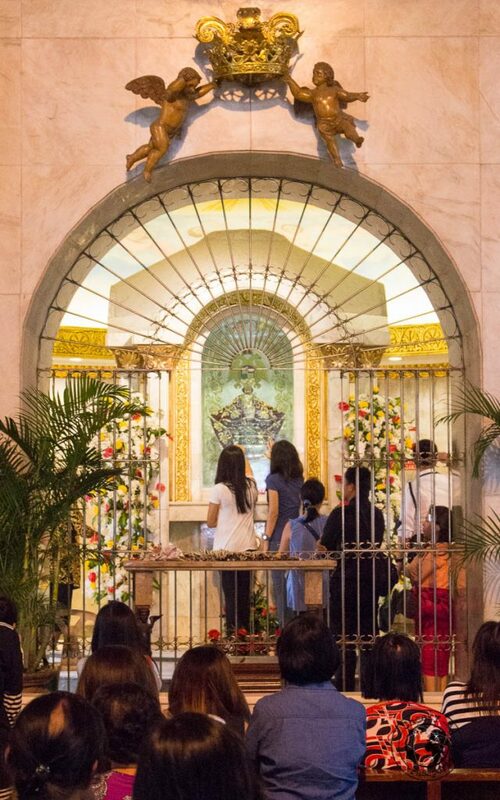 The Basilica and more specifically the annex chapel hosts the 1.5 foot long statue, attracting huge crowds of devotees on a daily basis. The icon is the same statue presented by the Portuguese Ferdinand Magallen (more about him later) to the consort of the Rajah (prince) of Cebu upon their christening in 1521. The ‘Minor’ Basilica is a huge complex, with grounds larger than the Cathedral itself, inclusive of a small internal garden, external prayer area packed full with lit candles, and a huge open arena, presumably for mass events such as First Holy Communions and general community events. Just outside of the Basilica, presumably part of the same complex, is a small shrine conserving the remains of the Magallen’s Cross, a historical landmark on this Cebu city walking tour. Ferdinand Magallen, famed as one of the conquistadors, was engaged by King Charles I of Spain to organise the Spanish expedition to the East Indies in search for better trade routes, which eventually resulted in the first ever circumnavigation of the globe. Unfortunately, he didn’t get to do the circumnavigation himself as he was eventually killed in the battle of Mactan, in the Philippines. 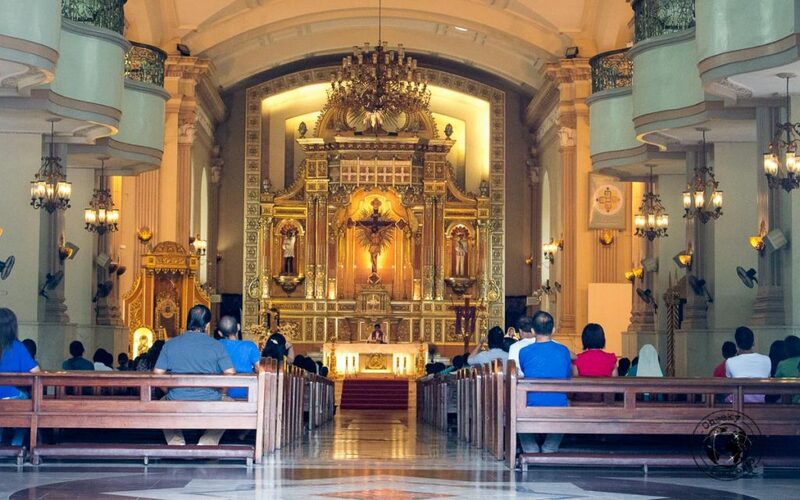 A few weeks before his death he landed in Cebu, where he gifted the local Rajah Humabon and his wife with a statue of the Holy child (Santo Niño – see above) and a wooden Cross upon their christening. This is considered by many as the symbol of the Christianization of the Philippines. The friendly Humabon later convinced Magellan to kill his enemy Datu Lapu-Lapu of Mactan. 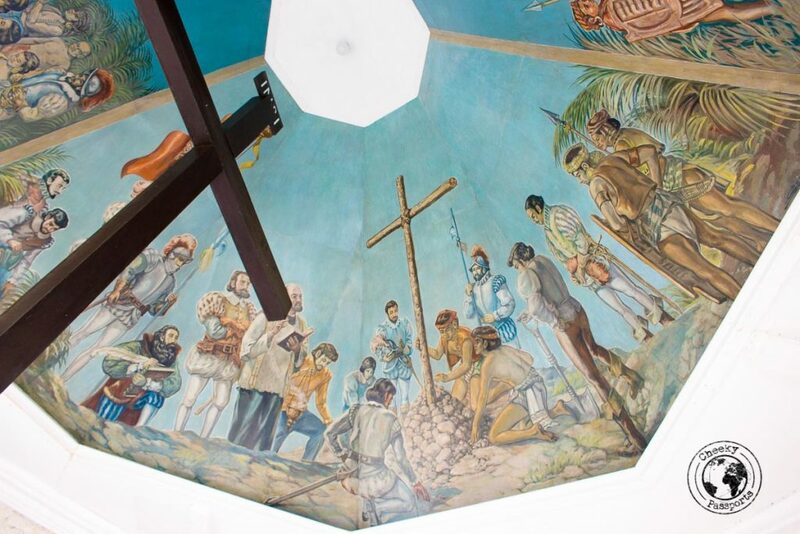 Magellan tried to convert Lapu-Lapu to Christianity; the rest, as they say, is history. The original cross is enclosed in a marginally larger container, itself in the form of a cross and freely displayed in a shrine. The affresco at the top of the shrine is also an interesting depiction of the arrival of Magallen and his first encounter with the natives. Consider it to be an artistic history lesson! A few hundred meters down the route is Fort San Pedro. Originally built from wood as a first line of defence by Miguel Legazpi, conqueror of the Philippines, the fort was eventually reinforced to counter against the invading Muslims. Nowadays, the Fort walls and internal courtyard have been restored and converted to a botanical garden. Where once the walls used to defend external invaders, they now defend the ‘peace’ inside the garden, as this is one of the few places where one can be sheltered from the hustle and bustle of the city. The last waypoint on this Cebu city walking tour is optional, but in our view necessary to complete the full experience of Cebu’s best. The last stretch will lead you to no particular historical building, and could really be simplified if you get a taxi or trike! Inconspicuous in the design and external decorations, this almost derelict building hosts on its second floor one of the best providers of Lechon in Cebu, a speciality of this city. 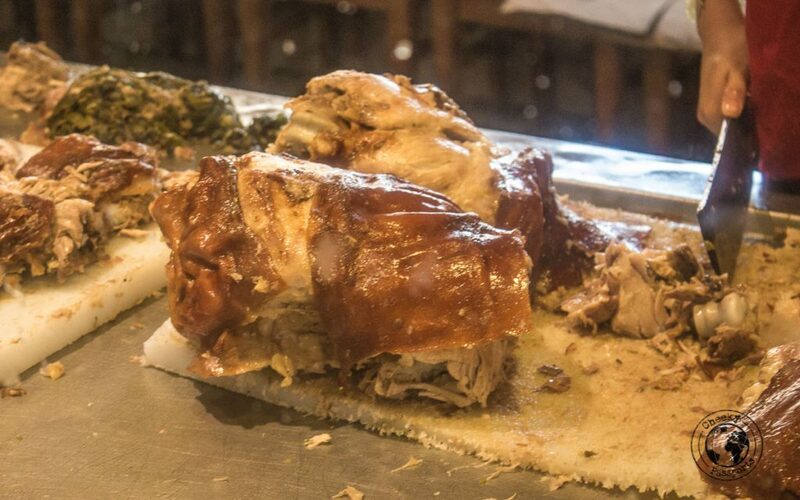 Sold in multiples of 250 grms, this roasted pork is something which you really don’t wish to miss. Consider it as your remuneration after such a long walk! …but be warned, it is cooked in the morning, and only served until the stock lasts (typically around noon!). Should you not arrive in time to sample the mouthwatering lechon, don’t despair, the food court at the nearby SM City Hall offers quite a vast selection of good food! 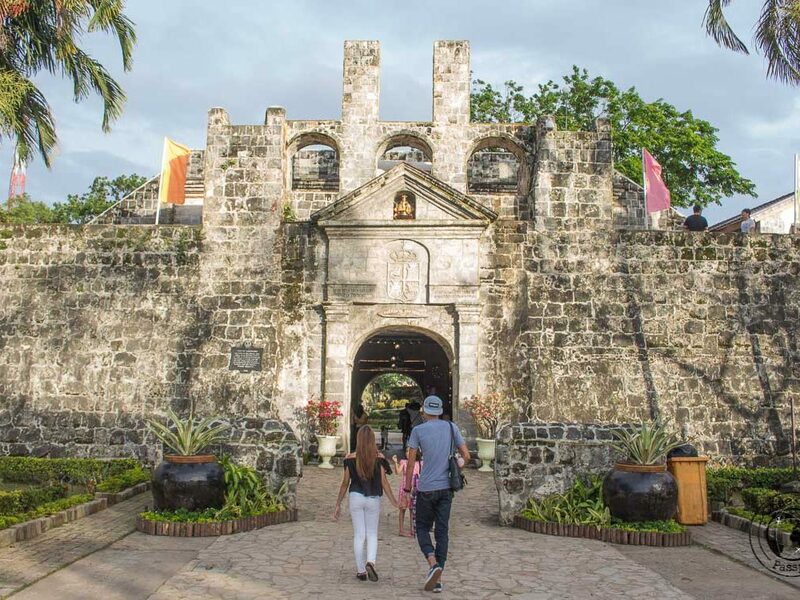 Cebu city is not known for its tourist spots, but we hope that this Cebu city walking tour will allow you get a glimpse of the city’s landmarks! Did You Like it? Pin it?